Pastor Mark Driscoll’s unexpected visit to the ‘Strange Fire Conference’ of Pastor John MacArthur on 18 October 2013 has raised great interest in the blogosphere. 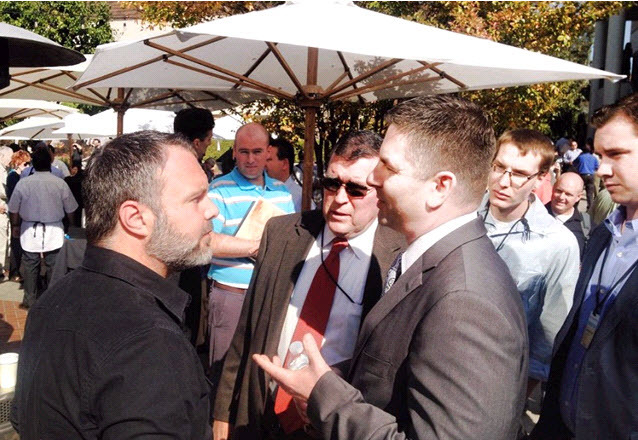 There has been much comment, most of it highly critical of Mark Driscoll, for many viewed his unannounced visit as gatecrashing the Conference of another church. Briefly, these are the facts of the matter. John MacArthur, a world famous reformed theologian, and senior pastor of Grace Community Church, (a non-denominational, evangelical mega-church founded in 1956 and located in Sun Valley, California) was holding a conference to warn of the unbiblical nature of the Charismatic Movement, which has become very prominent in the USA. When it comes to the gifts of the Holy Spirit, John MacArthur is considered to be a cessationist, for he believes that the charismatic gifts associated with the early church, like speaking in tongues and words of prophecy, ceased with the passing of the Apostles. Pastor Mark Driscoll, on the other hand is an ardent continuationist, who promotes the charismatic gifts as a sign of the Holy Spirit’s work in the Church. He has disparagingly labelled those who follow the cessationist position as ‘worldly’. In mid October 2013, Mark Driscoll, on his way to the ‘Act Like Men’ Conference, a profoundly charismatic conference where he would be a keynote speaker, along with James MacDonald, senior pastor of Harvest Bible Chapel, Chicago, Illinois, rap artist Lecrae and others, pitched up unannounced at MacArthur’s conference with a box of his new book, A Call to Resurgence: Will Christianity Have a Funeral or a Future? Hey #StrangeFire friends – see u in 1hr. I’ll have free copies of my new book. The chapters on tribalism & Holy Spirit may be helpful. Hey #StrangeFire Friends, I’m eating at In N Out Burger by the seminary. Come say Hi and get a free book. Security people at MacArthur’s conference were taken aback at the effrontery of a Christian pastor gatecrashing their conference, and handing out his new book. They asked him not to do so, and to take his books back to his car, but Driscoll refused to do so and offered his books as a gift to the Conference. MacArthur’s people had no option but to take the unwanted books to the Conference Office, whereupon Driscoll claimed that the books he was handing out had been confiscated by security. ‘Seriously, Mark! It does not take much commonsense that you just don’t hand out books at a conference that another church has organised without their permission. This is just common courtesy! And considering the differences of belief this could be looked upon as Mark trying to provoke Grace Community Church. Love does not provoke but love is long-suffering. I wonder which party was showing love. Umm… you don’t need to wonder too long! To help us understand Driscoll’s motivation, we need to remind ourselves that a few weeks before he had devised a publicity stunt to draw attention to himself and his new book. 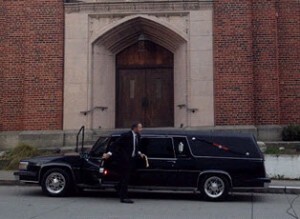 In early October 2013, to make his point that the church is dying, Pastor Mark Driscoll pulled up to a worship service at Mars Hill Church U-District in a black hearse, wearing a formal funeral-style suit. The purpose of this stunt was to promote his new book, due for release on November 5—the same day his Resurgence Leadership Conference 2013 is scheduled to begin. These two publicity stunts reveal much about Mark Driscoll’s character, attitude and conduct. Elsewhere on this website we have drawn attention to Driscoll’s unworthy behaviour, with regard to his crude language and casual dress in the pulpit. Here we see further evidence of his unworthy behaviour. The Apostle Paul’s message is clear: “Do nothing from selfish ambition or conceit, but in humility count others more significant than yourselves. Let each of you look not only to his own interests, but also to the interests of others” (Philippians 2.3-4). “Older men are to be sober-minded, dignified, self-controlled, sound in faith, in love, and in steadfastness” (Titus 2.2). Pastors and church elders, who are in positions of leadership, should be dignified and courteous in behaviour and conduct (1 Peter 2.8). Christians are to “lead a tranquil and quiet life in all godliness and dignity. This is good and acceptable in the sight of God our Saviour” (1 Timothy 2.1-3). Scripture is clear that love of God (godliness) and dignified conduct go together. Would a genuine Christian leader, concerned about the cause of Christ and His Church, gatecrash the conference of another church, showing so little consideration for other people? The answer is clearly No! In his unbecoming behaviour, Driscoll has failed to show respect or consideration for senior Pastor John MacArthur and his church. Driscoll has again demonstrated his childish unworthy behaviour to the world. And so we must ask, whose interest is Driscoll promoting? It seems that his actions are designed to promote his own selfish interests. Moreover, the provocative title of his book, Will Christianity Have a Funeral or a Future? suggests that the Christian Church is dying. Indeed, his suggestion that perhaps Christianity will have a funeral is to demean the Church, which is the body of Christ, “a chosen generation, a royal priesthood, a holy nation, a peculiar people”, who God has called out of darkness into his marvellous light (1 Peter 2.9). Christ is building His Church, and the gates of hell will not prevail against it. However, the counterfeit version of Christianity promoted by Mark Driscoll is indeed heading for a funeral. But the story does not end here for Driscoll, undoubtedly aware of the widespread criticism of his actions, has issued an open invitation to Pastor John MacArthur to come to his Resurgence Conference.